The role we each play in our own downfalls create the profound--and profoundly entertaining--basis for this series of linked "meditations" as the author of The Abilene Paradox takes another irreverent look at the nature of life on the job. In this work, Harvey explores the ethical, moral, and spiritual dilemmas we all face in the modern world of work. But he does it in a most unconventional way. His is an approach that mixes equal parts humor, philosophy, and insight to make us laugh, think, and examine organizational behavior in a brand new light. The twelve essays themselves carry such spirited titles as "What If I Really Believe this Stuff," "On Tooting Your Own Horn," and "Ode to Waco." Altogether, it's an enthralling collection of wise and witty parables that illustrate the redemptive value of the truth in a voice that is ultimately understanding of human shortcomings. JERRY B. HARVEY,well-known author of The Abilene Paradox and Other Meditations on Management, is a professor of management science at The George Washington University. He has consulted with business, government, various healthcare services, and the nonprofit sector and has published many articles in the fields of organizational behavior and education. Introduction: It's Not My Dog. 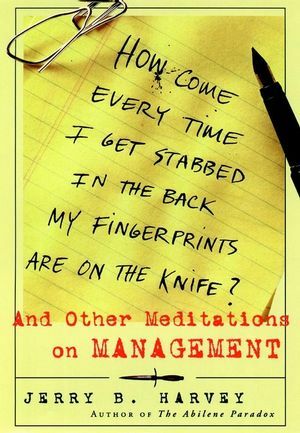 Some Thoughts About Organizational Back Stabbing or How Come EveryTime I Get Stabbed in the Back My Fingerprints are on theKnife? The Spin Doctors: An Invitation to Meditate on the OrganizationalDynamics of the Last Supper and Why Judas was not theTraitor. On the Ethics of Standing for Something or Sitting on OurDuffs. Prayers of Communication and Organizational Learning. This Is a Football: Leadership and the Anaclitic DepressionBlues. What If I Really Believe This Stuff? Musing About the Elephant in the Parlor or "Who the Hell Is ElliotJaques?" On Tooting Your Own Horn or Social Intervention as the Process ofReleasing Flatus in the Confines of Religious Institutions. Ode to Waco: When Bizarre Organizational Behavior Is Concerned, GodWorks in Strange and Mysterious Ways. When We Buy a Pig: The Tragedy of the No-Nonsesne Manager. Afterword: In Memory of Suzanne.